Product prices and availability are accurate as of 2019-04-25 09:56:34 UTC and are subject to change. Any price and availability information displayed on http://www.amazon.com/ at the time of purchase will apply to the purchase of this product. Stainless steel cutter. Zytel take care of with orange rubber insert. 5.13" handle. BUTTON launch. 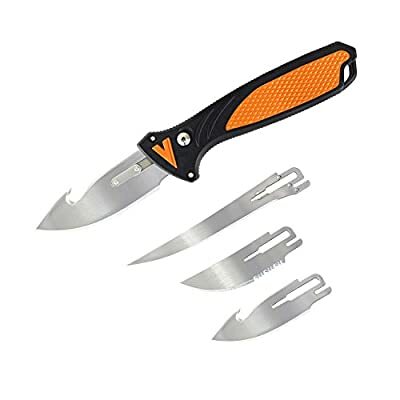 Comes with 5" fillet cutter, 3" somewhat ragged cutter, and also (2) 3" Guthook cutters. Includes tough roll pack that fits handle and also several compatible cutters and also features edge launch fastenings and also waistband band. Clam packed.